Cracked Tooth Syndrome is very common in teeth with large fillings in them and most often is seen in your back teeth. If the crack goes untreated, it may deepen or expand like a crack in a glass window, causing part of the tooth to break off. If this occurs, the tooth may have to be extracted or might need root canal treatment in an attempt to save the tooth. Some of the symptoms of this occurrence are: pain on chewing, unsolicited pain, pain from cold air, no x-ray evidence of the problem and no dental decay present. 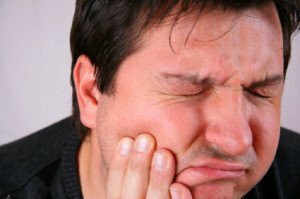 Often it is difficult for the patient to determine which tooth is causing the pain. However, the absence of pain does not rule out the presence of a crack. To determine if a tooth has developed a crack that is not visible to the naked eye, the dentist will take a through dental history including history of trauma to your teeth and history of any bite adjustments that were performed. The teeth in the problem area will be examined with a dental explorer. Hot and cold sensitivity of the teeth will be tested. If a severe pain is elicited with temperature, and the pain rapidly subsides with removal of the stimulus, it is usually indicative of a fracture. Sometimes, transillumination [light source] with magnification is used to help visualize the suspected crack. The diagnosis can be further confirmed when the dentist uses a plastic or wooden instrument or cotton roll that rests on one part of a tooth while you are asked to bite down. Pain in a specific areas helps isolate the position of the crack. In certain instances, removal of a restoration [filling] may be necessary to visualize the crack and assess its potential to harm the pulp nerve. Can cracks be treated so that the tooth can be saved? Yes. Unfortunately, cracked teeth don’t heal themselves like your bones. Early diagnosis leads to a better chance of success. The best solution is to have a full crown [cap] placed over the tooth to strengthen and hold the tooth together. What is the treatment outcome of cracked teeth? There is extreme unpredictability when treating cracked teeth. The first step is to place a crown on the tooth, this usually works in preventing pain. If a crown does not eliminate the pain, a root canal is preformed. The root canal is usually sufficient to end the pain. However, sometimes this does not work and the tooth will have to be extracted and replaced with a dental implant. The severe unpredictability of cracked teeth makes them unpredictable. Each treatment is usually successful. However, it is important to understand that there is treatment progression in treating cracked teeth 1) Crown 2) Root Canal 3) Extraction. One never knows when the first two options will work. Moving straight to option three is way to aggressive. The cracked tooth can’t be saved, now what? The absolute best options for replacing a cracked tooth that can’t be saved is with a dental implant. Dr. Nugent’s mother-in-law ended up losing a tooth that had been cracked. Dr. Nugent used dental implants to replace their missing teeth. Call our Pasadena Texas dental office 713-941-8261 for questions or to set up an appointment if you are experiencing any of the cracked tooth symptoms. Visit us at 3421 Burke Rd Ste A, Pasadena, Texas 77504.